Creating a return is how to notify the retailer that you have received item(s) back from the customer (or the delivery could not be made and was returned). Follow these steps to create an invoice in the Portal. Option 1: Using the Search bar at the top of any page in the Portal, enter in the order number. 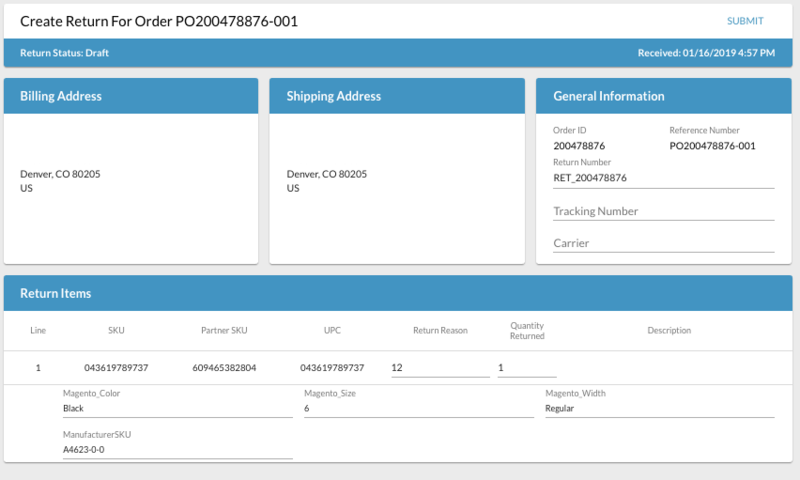 This will pull up all related documents to the order (the order as well as any existing shipments, returns and/or cancellations). Option 2: Click on Orders in the left-hand menu, and from the Order Management page, find the order. 1. On the Order Management page, click on Actions and select Return Items. 2. You will be taken to the Create Return page. This is where you will create a return from an order. The Billing and Shipping Address information is pre-populated with the information originally submitted on the order. In the General Information section, Return Number is a unique identifier for each individual acknowledgement file that will be submitted. Logicbroker auto-populates the field but it can be modified as needed. No other fields are required in this section. If you create more than one acknowledgement for an order (example: accept all items initially, then you need to cancel an item), you will need to modify this number on the 2nd acknowledgement to ensure it is different than the one created on the 1st acknowledgement. In summary, every acknowledgement should have a unique acknowledgement number. Update the Quantity Returned based on what was returned to you. Update the Return Reason either with a pre-determined code that has been shared with you OR provide a brief word or two on the return reason. Once ready, click Submit (top right corner of the page).